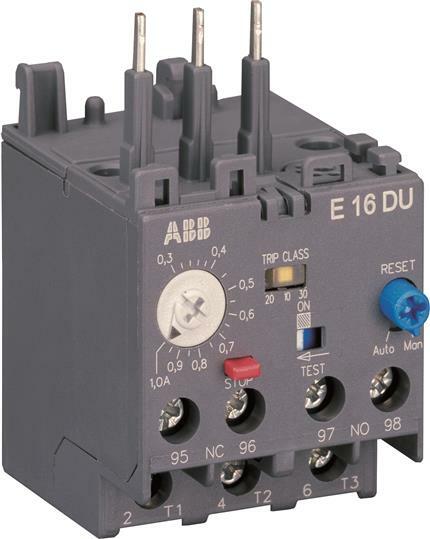 The E16DU-1.0 is an self-supplied electronic overload relay, which means no extra external supply is needed. It offers reliable and fast protection for motors in the event of overload or phase failure. Easy to use like a thermal overload relay and compatible with standard motor applications, the electronic overload relay is convincing, above all, due to its wide setting range, high accuracy, high operational temperature range and the possibility to select a trip class (10E, 20E, 30E). Further features are the temperature compensation, trip contact (NC), signal contact (NO), automatic- or manual reset selectable, trip-free mechanism, STOP- and Test function and a trip indication. The overload relays are connected directly to the contactors. Single mounting kits are available as accessory. 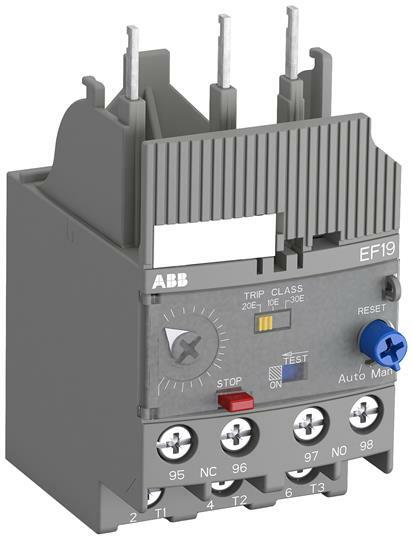 The EF19-0.32 is an self-supplied electronic overload relay, which means no extra external supply is needed. It offers reliable and fast protection for motors in the event of overload or phase failure. 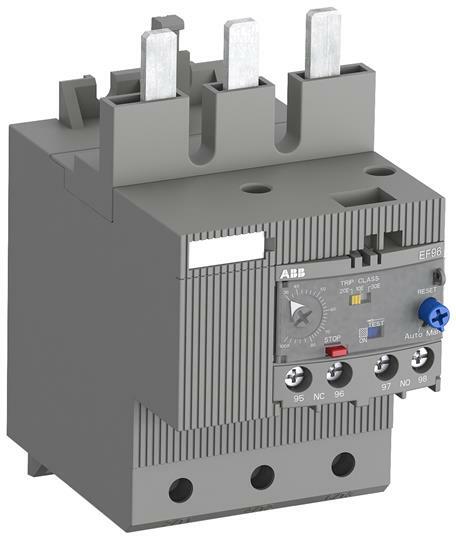 Easy to use like a thermal overload relay and compatible with standard motor applications, the electronic overload relay is convincing, above all, due to its wide setting range, high accuracy, high operational temperature range and the possibility to select a trip class (10E, 20E, 30E). Further features are the temperature compensation, trip contact (NC), signal contact (NO), automatic- or manual reset selectable, trip-free mechanism, STOP- and Test function and a trip indication. The overload relays are connected directly to the contactors. Single mounting kits are available as accessory. 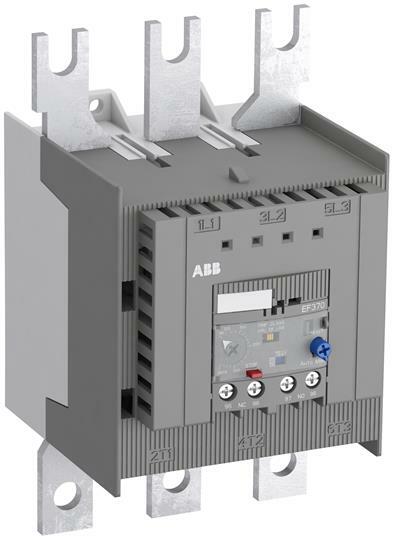 The EF45-30 is an self-supplied electronic overload relay, which means no extra external supply is needed. It offers reliable and fast protection for motors in the event of overload or phase failure. Easy to use like a thermal overload relay and compatible with standard motor applications, the electronic overload relay is convincing, above all, due to its wide setting range, high accuracy, high operational temperature range and the possibility to select a trip class (10E, 20E, 30E). Further features are the temperature compensation, trip contact (NC), signal contact (NO), automatic- or manual reset selectable, trip-free mechanism, STOP- and Test function and a trip indication. The overload relays are connected directly to the contactors. Single mounting kits are available as accessory. 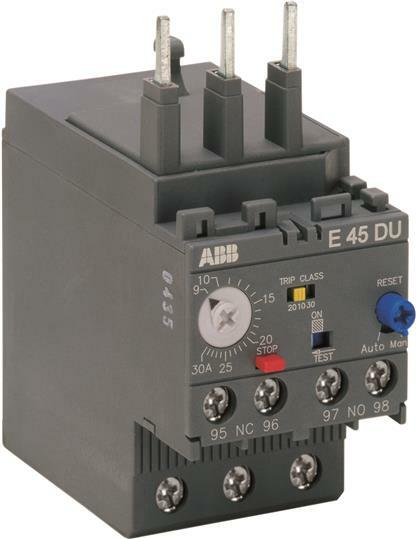 The E45DU-30 is an self-supplied electronic overload relay, which means no extra external supply is needed. It offers reliable and fast protection for motors in the event of overload or phase failure. Easy to use like a thermal overload relay and compatible with standard motor applications, the electronic overload relay is convincing, above all, due to its wide setting range, high accuracy, high operational temperature range and the possibility to select a trip class (10E, 20E, 30E). Further features are the temperature compensation, trip contact (NC), signal contact (NO), automatic- or manual reset selectable, trip-free mechanism, STOP- and Test function and a trip indication. The overload relays are connected directly to the contactors. Single mounting kits are available as accessory. 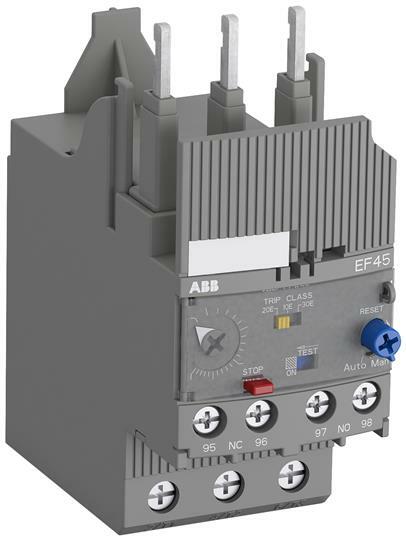 The EF65-70 is an self-supplied electronic overload relay, which means no extra external supply is needed. It offers reliable and fast protection for motors in the event of overload or phase failure. Easy to use like a thermal overload relay and compatible with standard motor applications, the electronic overload relay is convincing, above all, due to its wide setting range, high accuracy, high operational temperature range and the possibility to select a trip class (10E, 20E, 30E). Further features are the temperature compensation, trip contact (NC), signal contact (NO), automatic- or manual reset selectable, trip-free mechanism, STOP- and Test function and a trip indication. The overload relays are connected directly to the contactors. Single mounting kits are available as accessory. The EF96-100 is an self-supplied electronic overload relay, which means no extra external supply is needed. It offers reliable and fast protection for motors in the event of overload or phase failure. 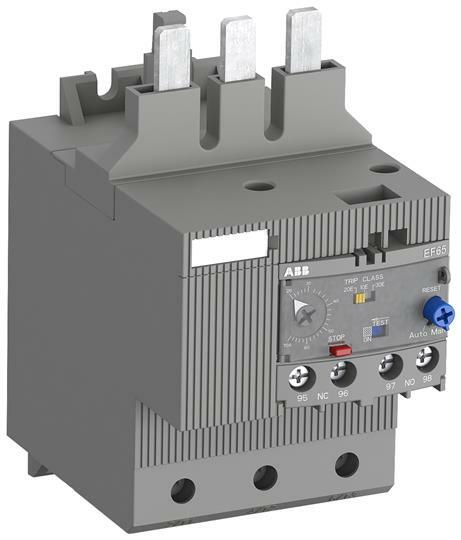 Easy to use like a thermal overload relay and compatible with standard motor applications, the electronic overload relay is convincing, above all, due to its wide setting range, high accuracy, high operational temperature range and the possibility to select a trip class (10E, 20E, 30E). Further features are the temperature compensation, trip contact (NC), signal contact (NO), automatic- or manual reset selectable, trip-free mechanism, STOP- and Test function and a trip indication. The overload relays are connected directly to the contactors. Single mounting kits are available as accessory. 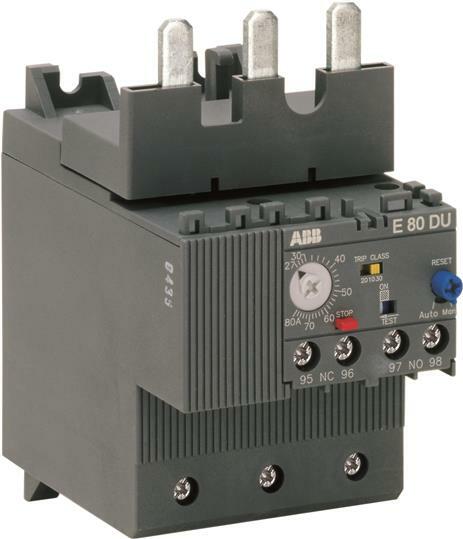 The E80DU-80 is an self-supplied electronic overload relay, which means no extra external supply is needed. It offers reliable and fast protection for motors in the event of overload or phase failure. Easy to use like a thermal overload relay and compatible with standard motor applications, the electronic overload relay is convincing, above all, due to its wide setting range, high accuracy, high operational temperature range and the possibility to select a trip class (10E, 20E, 30E). Further features are the temperature compensation, trip contact (NC), signal contact (NO), automatic- or manual reset selectable, trip-free mechanism, STOP- and Test function and a trip indication. The overload relays are connected directly to the contactors. Single mounting kits are available as accessory. 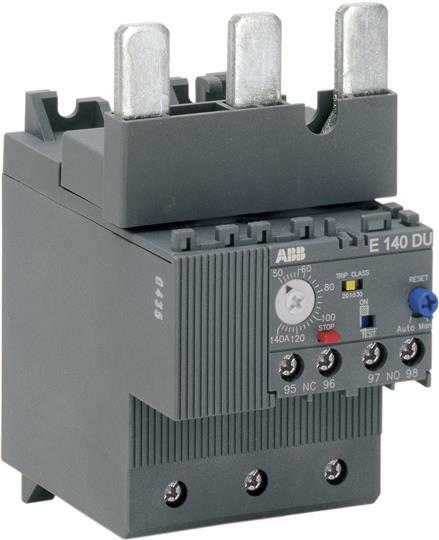 The E140DU-140 is an self-supplied electronic overload relay, which means no extra external supply is needed. It offers reliable and fast protection for motors in the event of overload or phase failure. Easy to use like a thermal overload relay and compatible with standard motor applications, the electronic overload relay is convincing, above all, due to its wide setting range, high accuracy, high operational temperature range and the possibility to select a trip class (10E, 20E, 30E). Further features are the temperature compensation, trip contact (NC), signal contact (NO), automatic- or manual reset selectable, trip-free mechanism, STOP- and Test function and a trip indication. The overload relays are connected directly to the contactors. Single mounting kits are available as accessory. The EF146-150 is an self-supplied electronic overload relay, which means no extra external supply is needed. It offers reliable and fast protection for motors in the event of overload or phase failure. Easy to use like a thermal overload relay and compatible with standard motor applications, the electronic overload relay is convincing, above all, due to its wide setting range, high accuracy, high operational temperature range and the possibility to select a trip class (10E, 20E, 30E). Further features are the temperature compensation, trip contact (NC), signal contact (NO), automatic- or manual reset selectable, trip-free mechanism, STOP- and Test function and a trip indication. The overload relays are connected directly to the contactors. Single mounting kits are available as accessory. 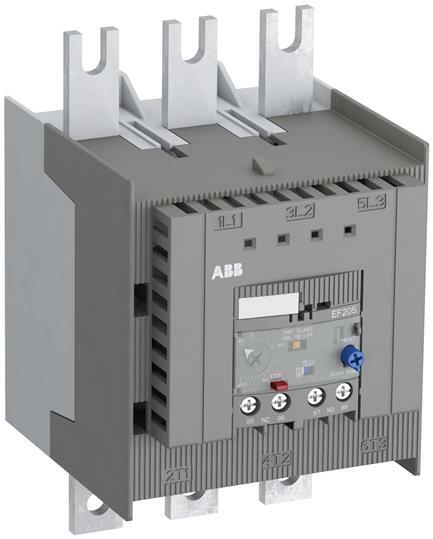 The EF205-210 is an self-supplied electronic overload relay, which means no extra external supply is needed. It offers reliable and fast protection for motors in the event of overload or phase failure. Easy to use like a thermal overload relay and compatible with standard motor applications, the electronic overload relay is convincing, above all, due to its wide setting range, high accuracy, high operational temperature range and the possibility to select a trip class (10E, 20E, 30E). Further features are the temperature compensation, trip contact (NC), signal contact (NO), automatic- or manual reset selectable, trip-free mechanism, STOP- and Test function and a trip indication. The overload relays are connected directly to the contactors. 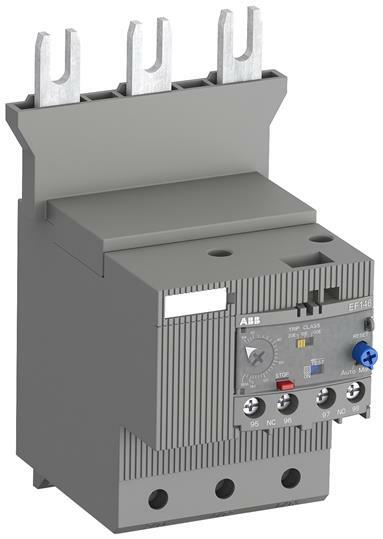 The EF370-380 is an self-supplied electronic overload relay, which means no extra external supply is needed. It offers reliable and fast protection for motors in the event of overload or phase failure. Easy to use like a thermal overload relay and compatible with standard motor applications, the electronic overload relay is convincing, above all, due to its wide setting range, high accuracy, high operational temperature range and the possibility to select a trip class (10E, 20E, 30E). Further features are the temperature compensation, trip contact (NC), signal contact (NO), automatic- or manual reset selectable, trip-free mechanism, STOP- and Test function and a trip indication. The overload relays are connected directly to the contactors. 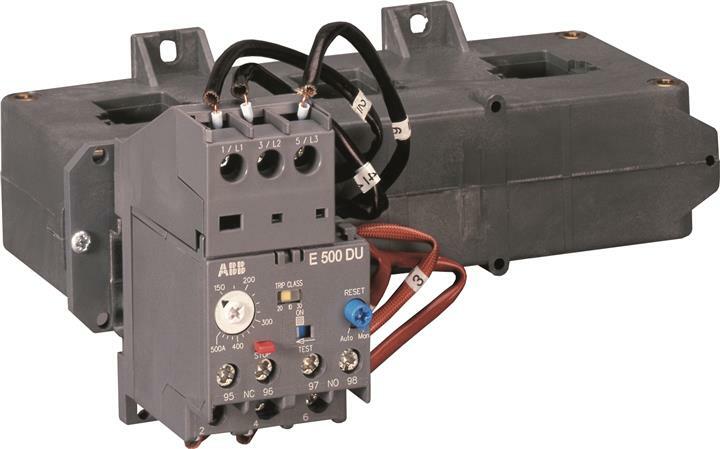 The E500DU-500 is an self-supplied electronic overload relay, which means no extra external supply is needed. It offers reliable and fast protection for motors in the event of overload or phase failure. Easy to use like a thermal overload relay and compatible with standard motor applications, the electronic overload relay is convincing, above all, due to its wide setting range, high accuracy, high operational temperature range and the possibility to select a trip class (10E, 20E, 30E). Further features are the temperature compensation, trip contact (NC), signal contact (NO), automatic- or manual reset selectable, trip-free mechanism, STOP- and Test function and a trip indication. The overload relays are connected with a mounting kit to the contactors.